This post is about the history of scuba diving. The term SCUBA (an acronym for Self-Contained Underwater Breathing Apparatus) arose during World War II, and originally referred to United States combat frogmen's oxygen rebreathers, developed by Dr. Christian Lambertsen for underwater warfare. It is now usually thought of as a regular word—scuba. It has become acceptable to refer to "scuba equipment" or "scuba apparatus". Today, the term has come to refer to diving in general and the open circuit breathing system in use today. Early diving relied exclusively on air pumped from the surface, scuba divers carry their own source of breathing gas (usually compressed air), allowing them greater freedom than with an air line. Looking back to early history of scuba diving, during the 16th and 17th century, innovators developed a diving-bell that holds compressed air within the device. By the 18th century, compressing air into a container able to withstand high pressure was developed. Trapped air was compressed in oak barrels, carried by divers. During this time, waterproof diving suits were also made by placing grease on leather. By the next century, helmets were used in diving. The helmets were linked to a tube taking in air above water. It was also during this time that diving suits were matched with helmets, although the head gear was joined to the suit with straps. After a decade, rubber suits and helmets were sealed to make the equipment airtight. History of scuba diving equipment invention. 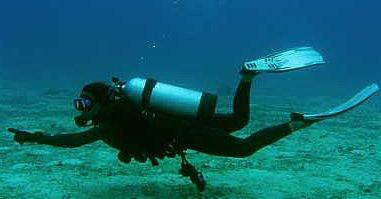 By the 1930's, the basic equipment of scuba diving mask, scuba diving fins and snorkel were widely used. Rubber goggles with glass lenses were developed by Guy Gilpatric in 1930. Scuba fins, or "swimming propellers," as they were referred to, were patented by Louis de Corlieu in 1933. In1943 when Jacques-Yves Cousteau and Emile Gagnan redesign and test the first "aqualung," or open air circuit, we use today. This allowed divers to receive compressed air on the slightest intake of breath. The first wetsuit was introduced by researchers at the University of California in 1956. The first wetsuits were made by Edco. Scuba Diving History refers that in the 1970, scuba equipment continued to evolve and the typical scuba system was enhanced by buoyancy compensation vests, better valves and submersible pressure gauges. Through the 1980's and 1990's, scuba as a recreational sport became a multi-billion dollar industry with its popularity prompting even more innovation in the design and the engineering of better, safer, lighter, more comfortable equipment. This invention revolutionizes the sport of diving. Today, scuba diving is accessible to almost anyone with only a modest investment in equipment. Anywhere you want to dive you can usually find a dive shop to buy or on rent. The history of scuba diving suggests that scuba diving developed out of man's drive to survive and learn more about life underwater. With new technology, the reasons for wanting to breath underwater diversified. Initially, this was considered as a profession and source of livelihood. Then this became viewed as a scientific research exploration before becoming a recreational activity. Thank you for this post. Now i know about Scuba Diving History. Thanks for great information about scuba diving I really like after read and planning to visit diving places. I only do the activity like snorkeling because I love this activity. It has lots of advantages like if you do this activity you never have to take your face out of the water and you can’t miss any of the action. Otherwise goggles are possibly more comfortable but have to take your face out of the water after every dive down. Now I am also trying the scuba diving whenever I visited somewhere. Furthermore, try to visiting Virginia where you can enjoy all activities including snorkeling and scuba diving. The top places are Sand Bridge Beach, Hampton and Virginia Beach. Helpful post for understanding Scuba diving history.